A man who is always seen to wear sunglasses and a bartender's suit. Although quiet and nondescript while not angered, he has a very short fuse and fights with incredible strength. Despite his simple and unrefined fighting skills, he is often considered the strongest fighter in the series. In the novels his power is described as the naturally unlimited form of human strength and likened to "adrenaline power" that can give people superhuman strength in times of emergency. In addition, Shizuo is capable of often superhuman parkour moves, a skill he obtained naturally from years of hunting down Izaya Orihara. 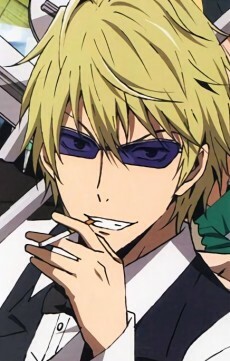 Shizuo works as a bodyguard for a debt collector in Ikebukuro and carries intense animosity towards Izaya. He has a younger brother, Kasuka, who is a top idol under the showbiz name of Hanejima Yuuhei. He is also a long-time acquaintance of Celty. His first and last name translates literally into "serene man" and "peaceful island" respectively.